Caffeine is still one of the most popular drugs in the world today. Nearly every country consumes it in some form, whether it’s in coffee, tea, chocolate or an energy drink. A whopping 21,000 studies have been conducted on caffeine over the past 60 years, and despite that, researchers still have not reached any definitive conclusions as to whether caffeine is good or bad for us. From what different studies have shown, the answer is that it may be a little of both. Too much caffeine can over-stimulate the nervous system, causing increased anxiety, heart palpitations, insomnia and other sleep disturbances. However, consuming coffee in moderation has been shown to have a protective effect, helping to guard against the development of many diseases, including Alzheimer’s disease, gallstones, liver cancer and type 2 diabetes, to name just a few. Studies have also shown that it lowers the risk of stroke in women. Caffeine spurs the release of dopamine in the brain, which is the chemical responsible for problem solving, alertness and feelings of pleasure. An Austrian study found that drinking a cup of coffee boosted brain power for 45 minutes following ingestion, so drink a cup before taking a test or going to an important meeting where your mind needs to be at its sharpest. Scientists believe the dopamine-activating power of caffeine may be why they found that men who drink four or more cups of coffee each day have half the risk of developing Parkinson’s disease as those who drink none, according to a Harvard study. The most current research indicates that there is no reason to be concerned about an increased risk of cancer or heart disease from drinking moderate amounts of coffee. The first studies that had been done on caffeine that reached such a conclusion have been shown to have had serious flaws. Primarily, they had not taken into consideration other significant lifestyle habits that went along with increased coffee drinking that have proven to be a major cause of these diseases, such as smoking and lack of exercise. Not only does caffeine not increase your risk of cancer, it has been shown to have a protective effect against many forms of the disease. Studies have found that drinking even a few cups of coffee each day can cut a man’s risk of developing prostate cancer by as much as 30 percent, and those who can manage to down six cups of coffee each day reduce their risk by 60 percent of developing one of the more dangerous forms of prostate cancer. Another study published in the Archives of Internal Medicine found that women who drink coffee (four cups per day) have a 20 percent lower risk of depression than those who drink no coffee at all. 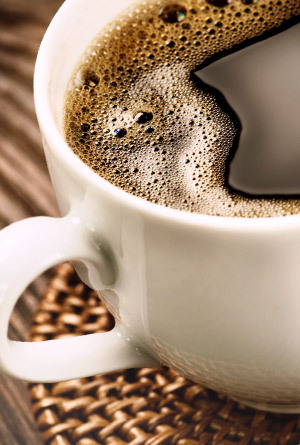 Caffeine is known to enhance feelings of wellbeing and boosts energy. The important thing is to consume coffee only in moderate amounts, particularly if you are pregnant or caffeine-sensitive. But the research seems to show that, at the end of the day, the benefits of coffee consumption outweigh most of the risks.